Hurting profits: The Tata Steel plant in Jamshedpur. Lower steel and alloy prices hit the firm’s performance. 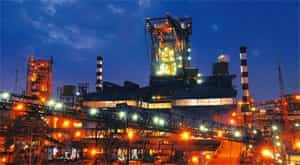 Mumbai: The country’s largest private sector steel maker, Tata Steel Ltd’s, second quarter (Q2) net profit halved compared with last year—disappointing investors—as lower steel and alloy prices erased the gains from increased demand from auto makers and builders. Tata Steel on Tuesday reported a stand-alone net profit of Rs903 crore for the quarter ended 30 September, down from the Rs1,788 crore reported a year earlier. The financial disclosure excluded the earnings of Anglo-Dutch unit Corus Group Plc, which Tata Steel bought in January 2007 for $11.3 billion. Tata Steel shares fell over 7% at the Bombay Stock Exchange on a day the exchange’s benchmark 30-share Sensex fell 2.31%. After rising to a one- year high of Rs600 per share on 17 October, the Tata Steel scrip closed at Rs501 on Tuesday. Profit from sale of steel fell 16% to Rs5,630 crore, from Rs6,726 crore in the same period last year. Koushik Chatterjee, group chief finance officer at Tata Steel, said, “Lower prices hurt" the company the most this quarter. “The same quarter last year was the best ever in the history of Tata Steel. Rs1,500 crore of the lower profit was because of steel prices and lower ferro alloy prices also cut our profit by Rs500 crore," he said. Tata Steel sold 1.45 million tonnes (mt) of steel in the period, 19% more than the 1.22 mt in the same three months in 2008. Sequentially, however, compared with the first quarter of 2009-10 (April-June), sales were up only marginally. Profits fell short of expectations of the median estimate of Rs974 crore by five analysts in a Bloomberg survey. Analysts were disappointed with the results, but are preparing for more bad news when the company announces its consolidated results (including its European operations) later this year. Niraj Shah, senior analyst at Centrum Broking, said Tata Steel’s quarterly performance was below expectations. “The company has not brought down costs to the extent they should have. There is more bad news in store, as the Corus Group disappointment is still round the corner." Rakesh Arora, who tracks the firm at Macquarie Research, said it has been a weak second quarter generally for steel companies. “It is true that interest costs have gone up, which is probably due to increased working capital needs," he said. Net finance charges rose to Rs392 crore, from Rs255 crore. Tata Steel is expanding its production capacity by 40%, to 10 mt by April 2011. Its total outstanding debt stood at Rs24,236 crore. “We have prepaid Rs2,121 crore of debt in the first six months of this year and have taken new debt of Rs5,600 crore," Chatterjee said. “I don’t think they are out of the woods yet," Centrum’s Shah added. H.M. Nerurkar, managing director (MD) of Tata Steel, said he expects steel demand from capital goods, auto and electric appliances makers. “Volumes will continue to rise. Imports in this quarter also put pressure on prices and going forward this will remain. Last year we were selling steel at Rs40,000 per tonne and this year it is down to Rs30,000 per tonne." Nerurkar said he expects margins to come under pressure as prices of raw materials, such as coal and iron ore, start firming up next year on the back of Chinese demand. He does not expect any change in domestic steel prices. Kirby Adams, MD and chief executive of Tata Steel Europe, the holding company for Corus Group, said there are “signs" of an improvement in Europe since the last quarter. Tata’s European subsidiary Corus is slated to announce results in the next four weeks. “We are deriving strength from inventory restocking and some speculative buying in steel," Adams said. During the first quarter earnings conference, B. Muthuraman, vice-chairman of Tata Steel, had alluded to potential savings (in Corus’ operations) in excess of £800 million (Rs6,120 crore today). “Two initiatives, code named ‘Weathering the Storm’ and ‘Fit for the Future’ are currently under way at Corus, which has started paying off," Muthuraman had indicated then.